I'm out of town for a couple of days, so my sweet #SundaySupper friend Betsy from Desserts Required is guest posting for me today. She's sharing a fabulous chocolate chip meringue cookie that would be a perfect addition to your upcoming holiday cookie trays! Hello to The Weekend Gourmet! I am so excited that Wendy asked me to guest post for her while she is out of town. I met Wendy through Sunday Supper, and when she spoke at the Food & Wine Conference about making a media kit, I was hooked! Wendy’s fabulous Texan warmth shines through in everything she does. Speaking of shining through, these Chocolate Chip Vanilla Bean Meringue Cookies always bring a ray of sunshine to the table. I just love a deliciously, crisp meringue cookie; however, living in South Florida where the humidity is about 5000% during the summer, I know all too well that attempting to make them on a humid day is not a good idea. 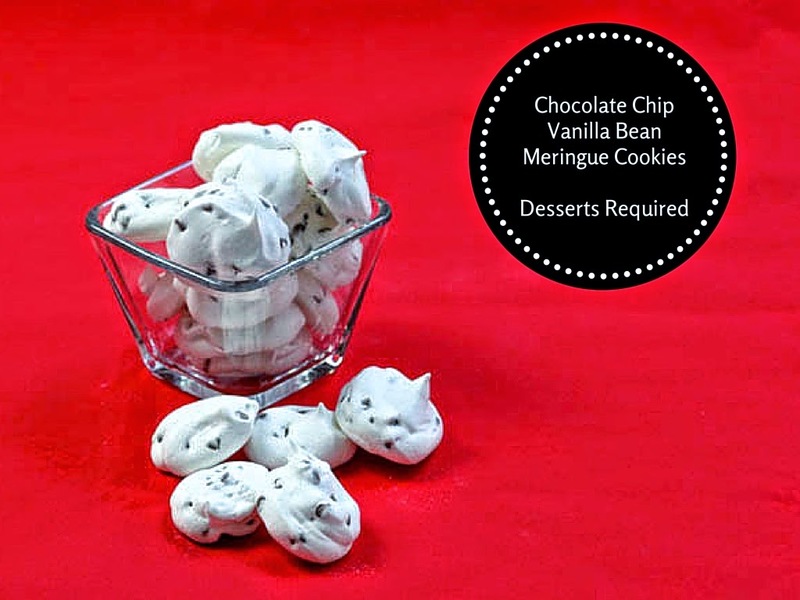 Chocolate Chip Vanilla Bean Meringue Cookies are great to serve at holiday get-togethers. If you are so inclined, feel free to add a few drops of your favorite food coloring to bring in the festive colors of the holiday season. They also make wonderful, delectable gifts -- assuming you can refrain from eating all of them yourself. For such emergencies, the recipe doubles, beautifully. Step 1: Preheat the oven to 200°. Line two baking sheets with parchment paper and set aside. Cut the vanilla bean in half lengthwise and scrape the seeds out of the bean. Add them to the sugar and set aside. Step 2: Combine the egg whites and cream of tartar in a large mixing bowl, and beat on medium speed until soft peaks form. While the mixer is still running, gradually add the sugar mixture. Scrape the bowl down and continue to beat on high speed until the mixture is stiff and shiny, about 3 minutes. Remove from the mixer and stir in the chocolate chips. Step 3: Place a gallon size plastic freezer bag into a tall glass. Fold down the opening edges away from the glass. Transfer the meringue to the plastic bag. Seal the bag. Cut off a 2” opening from one of the bottom corners of the plastic bag. Squeeze the excess air out of the bag. Squeeze the meringue onto the lined baking pans. Step 4: Bake at 200° for 1 hour, rotating the pans top to bottom and front to back halfway through. After 1 hour, turn the oven off and leave the cookies in the oven for 2 more hours. Remove from the oven and cool completely. If you prefer, a decorative or plain pastry tip may be put into the plastic bag before adding the meringue. To watch how Chocolate Chip Vanilla Bean Meringue Cookies are made, head over to my YouTube channel.